Vitamin Cooler™ has been specifically engineered to provide the best absorption possible. Vitamin Cooler™ offers the same vitamin and mineral concentrations as a traditional ‘vitamin pack’ but is purely in powder form to finally allow the body to fully absorb each and every component! Vitamin Cooler™ mixes conveniently in water so that all you need to do is drink a single delicious glass to get all the vitamin and minerals you need! Vitamin Cooler™ contains the full spectrum of vitamins, essential minerals, electrolytes and essential amino acids (EAAs) in order to supply your body with the most complete formula on the market today! 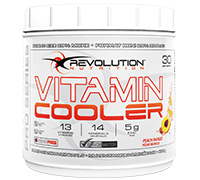 Vitamin Cooler™ is part of Revolution Nutrition™’s exclusive Flavor Match system. This system allows you to mix and match your favorite Revolution Nutrition™ products together in the same shaker bottle according to the flavor of your choice! You can thus add Vitamin Cooler™ to Whey Isolate Splash™, BCAA Splash™ or Carnitine Cooler™! Mix 1 scoop of Vitamin Cooler™ with 300 ml of cold water. Take daily with food.